Every year, a new game is released to continually challenge new and old teams alike and keep the playing field as level as possible. In 2015, ResQ was announced as the official test for FTC. The challenge video states that robots have a 30 second autonomous period where they can detect colors on a beacon and press the button corresponding to their team. After the button has been pushed, robots can deposit "climbers" into a bucket located behind the beacon. 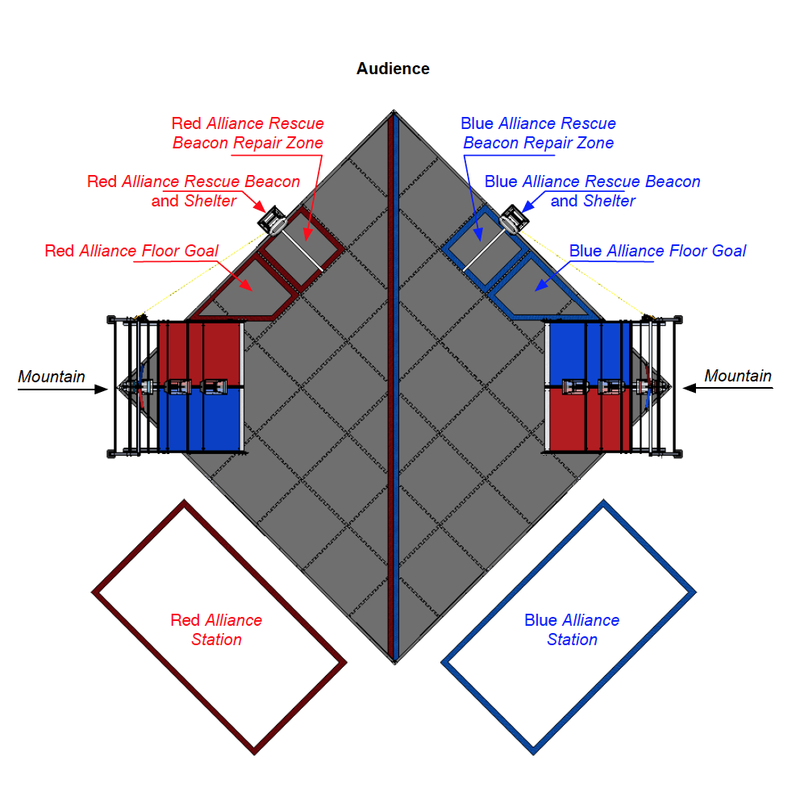 Robots may then begin to climb a mountain side that represents their team or park in a taped zone by their beacon for a small amount of points. Robots may also park anywhere on the field without penalty. During the driver operated period (2:00) the robots must navigate around "debris"; plastic balls and blocks that can be obtained 5 pieces at a time to score points (the debris is spread out on the field before autonomous begins). There are two mountains with two sides (each having a team color) that the four robots can climb. Three buckets lie in the middle on each mountain that the debris may be deposited in (each bucket also has a team color). Scoring debris in the wrong bucket will result in giving the enemy team points. The mountain also has "zip climber" triggers on only one side. Each team has the chance to flatten these three levers while venturing up the mountain. There are three zones on the mountain. A low zone, a mid zone, and a high zone. At the top of the high zone is a pull up bar, where robots can place their mechanisms to fully lift themselves to the point of where no other game elements are supporting it. On top of the pull up bar is an all clear "flag". Each team has the option to pull the team colored piece of PVC towards their direction for additional points. As a first year team, C4 engineers unanimously agreed to make our robot's focus on the mountain. Throughout the year we expanded our horizons, and made our robot as versatile as possible. Below are detailed entries of our finished product for the year. Our pull up mechanism consisted of an arm with three stages of extension and a powerful winch to lift the robot. The arm, crafted out of machined aluminum was thin, versatile, and light. Lifted by motors, the spring loaded mechanisms would autonomously slide the second extension and the third beam would swing out and place the hook, fashioned with velcro, magnets, and 3D printed placement holders onto the pull up bar. The arm would then retract, detaching the hook. The hook was equipped with special string that led back to a 3-1 dual motor winch with a custom machined spool. The robot would proceed to lift its self up the mountain until an ODS (optical distance sensor) would detect the pull up bar and disengage the winch to deploy a locking mechanism to ensure the gears don't spin backwards due to lack of torque in the winch motors. Like most teams, C4 originally prototyped a "weg" (wegs are wheels with large dips in them) drive system. However, after multiple failed attempts with 3D printed wheels we decided that they weren't efficient enough for precise movement, as well as they failed to climb the churros as well as we thought they would. At about the same time, we also decided that our 8 wheel drive system was too much and too complicated for no reason. We downgraded to 4 motors with 4 wheels, each wheel being a large rubber monster truck-esque type. With a few modifications, these new wheels brought us improved speed, precision, durability, stability and traction. While our autonomous laid underdeveloped until state champiomships, it became clear that to continue having an edge in competition we needed to score more points. With the physical option being off limits, our head programmer Miklos Bowling began working hard on developing a complex program to carefully steer the robot through the course. Using a calibrated gyroscope for steering, 3 color sensors for line following, and 2 more color sensors for beacon detection, we were able to start our autonomous at any place on the field. While driving to the beacon, the gyroscope was able to auto correct any course deviations, and the triple line sensors assured us that we would follow guiding lines as straight as possible. Upon arriving at the beacon, the color sensors would detect our team's color, and extend a linear servo to press the corresponding button. The robot would then deposit the climbers, and proceed to drive to the selected finish area. Not only can the robot start wherever it needs to, but the program is also outfitted with on the fly adjustable delay and a selection menu for where the robot finished for ultimate autonomous compatibility. The robot its self was fast and able to clear a significant amount of debris in a small amount of time. Aside form being the ideal candidate for defensive driving, all mechanisms and electronics were reliable with over an 80% success rate. Since the drive system modifications, the robot handled especially well on the mountain. It was able to climb to mid mountain in under 10 seconds. On the way, we had dual stage lever triggers. Spring loaded and made out of aluminum, we were able to hit all 3 zip liners with a 90% success rate. In collaboration with one of our biggest sponsors, Walking Tall, the robot was built on top of a custom designed baseplate. It made the robot extra sturdy and saved the team extraordinary amounts of time when building. Throughout the season, C4 earned a total of 7 awards and progressed to the furthest competition - the world championships. As a first year team, there was a lot of learning for both the coaches and the students. The team as a whole grew and our excitement for FTC only grew bigger. A huge shoutout and thanks to our amazing two coaches, Ted Willhite and Jeff Hewitt for getting us as far as we could go our first year as a team. Their dedication and determination is more than appreciated.